Dude put them on Craigslist, so I sent him an email re: how firm he was on price. Said the $385 price is firm. That's his BIN price as well. I may just hang around eBay since nobody has bid and I may just be able to grab 'em for under $300. For the amount of work needed, I won't go any higher. Yep. I paid 3 hundie for mine in about the same condition. Best if you tell him you have cash in hand and want to come over and audition. That way you can thoroughly pick through any imperfections. A lot of people don't see flaws. Plus tell him your kinda picky. Make small talk and try to make a friend that way it breaks down that barrier. My first SDAs. Babe (the big blue truck) and I headed down to Poway in the AM. My order for 4 new tweets should be placed by dinner time! Well done @Jaybeez !!! I reached out to the brother of the seller of those SDA 2Bs in LF that I did the recon on, but I he hasn't heard back from the seller. Adcom GFP-565 Pre-amp, Adcom GFA-565 Mono Block Amps (Front), Adcom GFA-585 Amp (Side), Adcom GFA-555 Amp (Rear), Adcom ACE-515, Pioneer CLD-3070 Laserdisc, Sony CDP-605esD, Sony BluRay BDP BX59, Samsung 50" Plasma, Polk Audio SDA SRS 1.2TL Front (Walnut), Polk Audio SDA SRS Side (Walnut), Polk Audio SDA SRS Rear (Walnut). Adcom GFP-565 Pre-amp (w/Big Sky Audio Upgrades), Adcom GFA-565 Mono Block Amps (w/Big Sky Audio Upgrades), Adcom ACE-515, Sony CDP-705esD, Magnum Dynalab FT-101A Etude, Polk Audio SDA SRS 2.3TL (Walnut), Polk Audio SDA SRS 2 (Walnut), STAX SR34 Electret Earspeaker System. Adcom GFP-555 Pre-amp, Adcom GFA-555 Amp, Sony CDP-605esD, Adcom GFT-555 Tuner, Polk Audio SDA 1C (Walnut). Hafler DH-110 Pre-amp, Hafler DH-220 Amp, Sony CDP-505esD, Hafler DH-330 Tuner, Polk Audio SDA 2B (Walnut). Figured that was the case, and this deal lined up perfectly. John Nooshin advised to pick them up (he knows what he's talking about), my wife is out of town today (always a good thing when acquiring new gear) and I had the day wide open, the truck filled, and as you know, today was the rainy day that never happened. Thanks for the recon on the others. 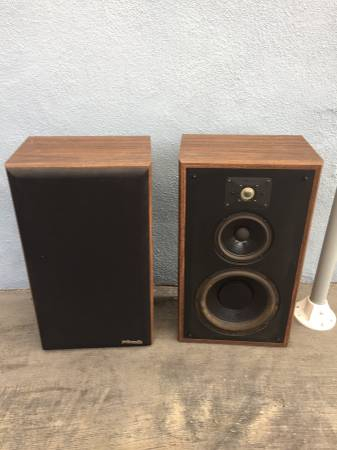 They looked like way more work and I think that while $100 is a fair offer for their condition the brother may well want to just part them out. I still owe you a Beverage of choice for your work though. We'll set something up, or if you want to join John and I for the LA Audio Show, we can settle up then. 8TLs claimed excellent. Asking $100. No affiliation. Expect that there will be bumps in the road. Choose to not let them rattle you. Lovin' my salvaged 10As! Assist to @lawdogg. Polk - SDA-2Bs, 11TLs, (4) M7s, RTi4s, RT35is, RTi28s, RT3s, S4s, M3s, various centers. Boston - S8, S6s, S4s. 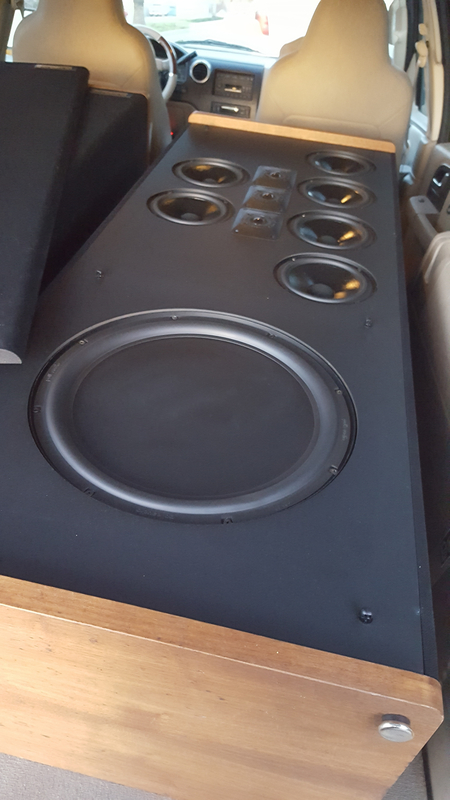 M&K V4, M&K VX-7B, JBL SUB150P, Jamo Sub 250, Realistic T1000s, and others. Donuts or no donuts, for 600 bucks buy asap. @Smallies they're strictly for tuning the F3(?) of the driver. I listen standing up. I'ma chunk some 10's in the top one. Umm huh?? WTH are you talking about? The speakers are beautiful, I'm not sure about the price. If they're 1.2 TLs, that's probably in the ballpark. Maybe I got mine cheap at $500, but I'd have hard time paying two grand for anything other than 1.2Tl's. Yeah, my bad, I was thinking 1.2TLs. Obviously those are 2.3 TLs.... $2000 is too much. HT/2Channel: Emotiva MMC-1, Adcom GFA-555II, Polk SDA 3.1's, Teac TN-300 TT, Polk Center and Sub. I'm seriously thinking about these now... I don't have the proper room (yet) but he'll, for that price. And I might get him down a bit too!